My wife and I took Friday off so we could do something we have been meaning to do for the past eight years but just never seemed to get around to: visit Leonardslee Gardens. 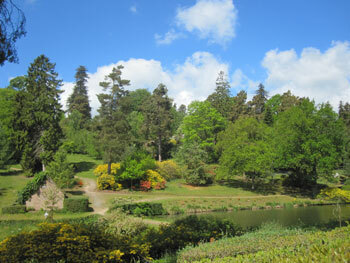 Leonardslee, one of the prettiest gardens in England. Leonardslee is just down the road from us. Hence the reason we have never visited; who wants to see something that is right in their own back yard? But Leonardslee is well worth the visit. 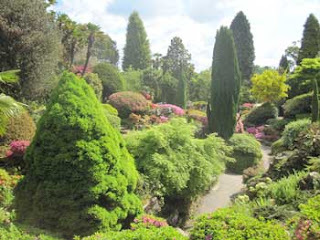 It is one of the largest and most spectacular gardens in England and the Loder family—who own it—are also responsible for two other magnificent Sussex gardens: The High Beeches and Wakehurst Place. These have been a splendid trio of gardens for many years, though sadly, they are soon to be twins. 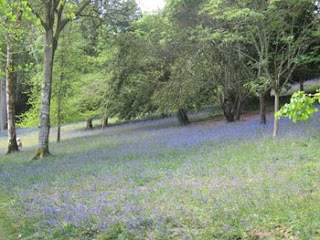 Bluebells in bloom at Leonardslee. Wakehurst Place is now safely in the hands of the The National Trust and The high Beeches, though privately owned, is still going strong, but after five generations of overseeing the gardens at Leonardslee, the Loader family is packing it in. This is to be their last season; after this, the fate of the garden is uncertain. Rumor has it that they sold out to some Russian zillionaire (who else, after all, could afford it) who is no doubt connected with the Russian mafia (name me a Russian zillionaire who isn’t). Imagine this as a landfill site. I realize the new generation of Loders probably has other ambitions aside from gardening, but it is surely a shame to see the tradition come to an end. The new owners are very likely already engaged in “negations” (“Nice house you have here; be a shame if something were to happen to it”) with local Councillors to gain permission to use the valley as a landfill so they can level the ground off and build high-rise tenements on it. Leonardslee is also home to the largest Wallaby herd in Sussex (though, really, how many would you need to have to gain that particular title?). The Wallabies, naturally, will have to go; you can't have them roaming feral around the car parks of the tenements, can you? I expect the new owners will host a combination Grouse and Wallaby Shoot during their first season, followed by a massive Walla-barbee-Q. 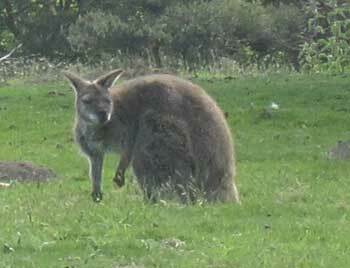 I’m just glad we made the effort to see these stunning gardens, and the adorable wallabies, while there was still time. Spring came into its own this past week and, uncharacteristically, carried on through the weekend. 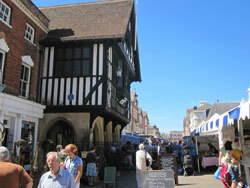 It was a wonderfully sunny and warm day on Saturday, which proved quite a bonus as my wife and I were heading to Essex to meet up with some of my fellow countrymen. We reconnected with NFAH, finally met a few other bloggers in person and enjoyed a lovely meal at an Italian restaurant in the charmingly twee village of Saffron Walden. And if it came to my attention during the meal that I was, once again, the lone male at a table full of women, I certainly didn’t think much of it. It’s just the way things are. But at one point, the subject of blogging and the blogging community was brought up (at a table full of bloggers, go figure) and I did point out that I seemed to be the lone male voice (with the notable exception of Brit Out of Water) in the expat world. I don’t consider my situation very unique, so why am I an honorary member of the Mummy Blogger crowd? The answer, it turns out, is screamingly obvious; I simply managed to avoid realizing it these past eight years: expat blogs tend to be written by the trailing spouse (stranger in a strange land and all that), and in every case I can think of (aside from myself and Dylan) that trailing spouse is female. Up until the moment one of my blogging friends pointed this out, I had never thought of myself as a ‘trailing spouse.’ But there you have it. At least in the future, when I go to these sort of gatherings, I won’t have to wonder about being the only guy there. And I always do enjoy meeting up with my fellow bloggers. We may be from different backgrounds in the States, with different experiences and different expectations, but when we meet up over here as expats, we bring with us so many shared experiences that the basis for a friendship is already present. The conversation, even from the initial introduction, is never awkward because we feel as if we know each other already. That’s a good way to be, even if I am the odd one out. We spent a relaxing few hours together in conversation, then parted, with promises to keep in touch. 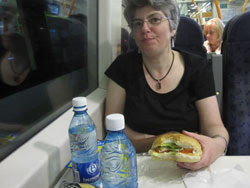 Then my wife and I took advantage of the commerce opportunities Saffron Walden afforded before heading home on the train. And as we passed through London, I naturally I treated my wife to dinner at an exclusive restaurant. Hey, I bought you dinner, what more do you want? All in all a remarkable day: good weather, good conversation, good friends and good food. I’m already looking forward to the next time. Wife: It’s a boiled sweet on a stick. Me: You mean like a Tootsie Pop? Me: It’s a hard candy on a stick, but with a piece of Tootsie Roll inside. Wife: What’s a Tootsie Roll? In the end, apathy and lack of money won the day. 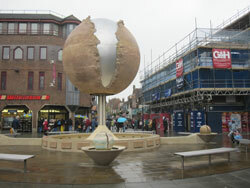 About a year ago, the Shelly Fountain, Horsham’s iconic and vaguely pornographic water feature, fell into such disrepair that it was shut off and left forlornly empty. 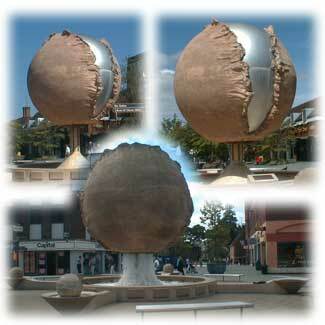 As time went on, the town polled the citizens to see what they wanted to do with this marvellous work of art that had put Horsham on the map. I wrote to the local paper stating the case for repairing the fountain, but it appeared I was a lone voice crying in a sea of curmudgeonly complaints. No one, it seemed, had wanted the poxy thing to begin with and they saw this as their chance to get shut of it. A Facebook page dedicated to bringing back the Horsham Christmas lights enjoyed 3,037 supporters; a similar page to show support for the fountain rallied only 315. Condemned by social networking, its fate was sealed; The Council decided it would have to go. So the great ball was propped up on steel girders and the fountain area surrounded by a metal fence, and there it sat, sad and broken, like a death-row inmate waiting for the padre and warden to lead it on that final walk to the metaphorical gallows. There would be no phone call from the governor. But then a miracle reprieve arrived from an unlikely source: the economy collapsed, austerity budgets were adopted and, when The Council looked into removing it, they found digging it out and paving over the area would actually cost a lot more than fixing it. Repairs began in March, which The Council made very clear were not paid for out of the district coffers but with grants from the art foundation. 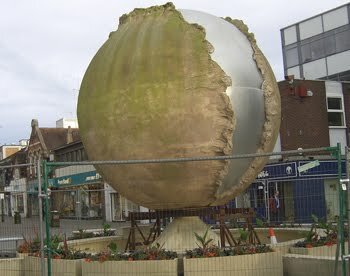 The fountain was cleaned and fixed and filled and ready to be re-unveiled at a ceremony during Horsham’s popular English Festival. At the appointed time, the crowd gathered, the speeches were made, the fountain revived…and shut off due to an electrical fault. So now it sits, a little cleaner, but empty, nonetheless, waiting for the repairman. But at least it’s still here.